Rural households in India – source of 60% of annual gold demand in the metal's No.2 consumer country – meantime got news of huge income support and tax cuts from the BJP Government, now 2 months away from national elections. With the Federal Reserve this week vowing to stay "patient" before raising Dollar interest rates, US employment rose by 304,000 in January, today's data said, beating Wall Street's average forecast by nearly 85%. 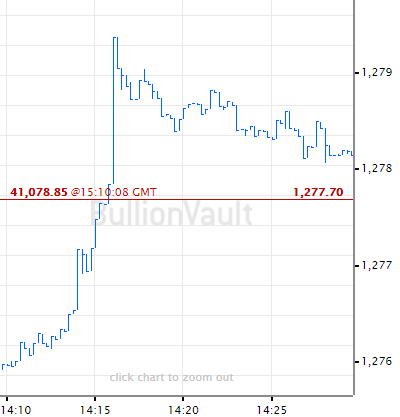 Gold prices in Shanghai earlier rose within 1 Yuan of early January's two-year highs at ¥287 per gram, but their premium above London gold bullion quotes slipped below $10 per ounce in Dollar terms, trimming the incentive for new bullion imports into the metal's No.1 consumer nation as the Chinese New Year holiday season began. Wholesale prices in India meantime held a $2 discount to London, suggesting a small glut of supply as import duty and sales tax – plus this week's Dollar price – pushed domestic Rupee prices up near all-time highs for consumers. 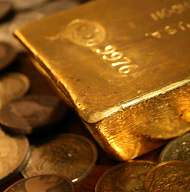 New Delhi's 2019 Government Budget – delivered today by finance minister Piyush Goyal – failed yet again to cut gold's 10% import duty as dealers had hoped. But tax relief for small farmers and middle-class earners " will be good for increasing jewelry demand," says Anantha Padmanabhan, chairman of the All India Gem & Jewellery Domestic Council. 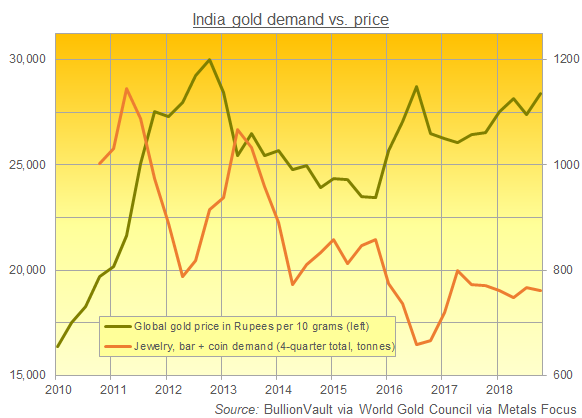 Formerly world No.1 but overtaken by China since 2013, India's household gold demand slipped 1.5% last year from 2017's small recovery according to this week's global demand data from the mining-backed World Gold Council, but remained almost 100 tonnes above 2016's multi-decade low of 670 tonnes. Standing in for Arun Jaitley – now in the US for medical treatment – Goyal didn't refer once to gold in today's speech to Parliament, but his supporting documents online repeat plans to develop and launch a "comprehensive Gold Policy to develop gold as an asset class" formally announced in last year's Budget. Announced alongside India's worst jobless rate in 45 years, this heavy spending by Narendra Modi's BJP Government will widen New Delhi's fiscal deficit to 3.4% of GDP. Today's high prices and high tax rates on gold mean smuggling volumes could rise by another one-half in 2019 reckons Haresh Acharya at the India Bullion & Jewellers Association, claiming that wholesale traders are asking 1.5% less per kilo for cash rather than check payment, to avoid a paper trail. "Innovative" smuggling tricks discovered by India customs officials include a new "rubbery form" where gold is mixed into an elastic compound and then hidden in shoes "or even tucked into underwear" says The Times of India today. 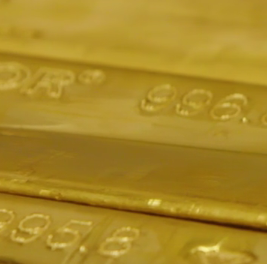 "[Gold sales are] slow despite the wedding season," says Acharya at he IBJA. "Everybody is waiting for gold prices to cool off, which does not seem likely to happen in the near future."